WASHINGTON, DC, August 25, 2011 (ENS) – Evacuation orders have started for North Carolina residents as Hurricane Irene barrels northwest from the Bahamas headed for the U.S. mainland. Now a Category 3 hurricane with winds of 115 mph, Irene is on track to reach the coast of North Carolina early Saturday. 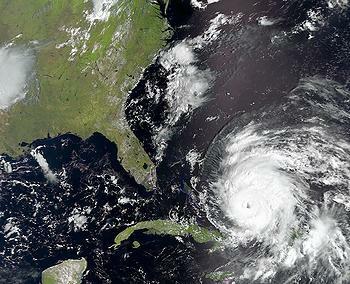 It will be first hurricane to strike the East Coast in seven years, and the first to make landfall anywhere in the country since Hurricane Ike struck Texas in 2008. North Carolina Governor Bev Perdue late Wednesday declared a state of emergency for counties east of Interstate 95 and asked President Obama to declare a pre-landfall emergency. Today the President did declare a state of emergency for North Carolina to provide federal assistance for response efforts. This morning, the National Weather Service issued a Hurricane Watch for the North Carolina coast from Surf City to the Virginia border. A Tropical Storm Watch is in effect from Surf City to Edisto beach in South Carolina. 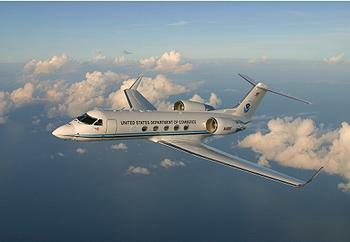 A NOAA research jet flew through the eye of Hurricane Irene today, collecting critical data for computer models that predict hurricane intensity and landfall. National Hurricane Center Director Bill Read told reporters this morning that the six-day-old storm is moving north-northwest at 13 mph across the northwest Bahamas blowing 115 mph, with higher gusts. With this evening’s 5 pm advisory, the National Weather Service extended hurricane watches north to the Mid-Atlantic states. The hurricane’s center has shifted slightly to the west, a shift that will make a big difference to millions of New York City residents. Mayor Michael Bloomberg said today instead of going across the eastern portion of Long Island Irene will strike closer to more densely populated eastern Queens. The city’s Coastal Storm Plan designates Zone A low-lying areas that are particularly at risk: Coney Island and Manhattan Beach in Brooklyn, Far Rockaway and Broad Channel in Queens, South Beach, Midland Beach, and other low-lying areas on Staten Island, and Battery Park City in Manhattan. 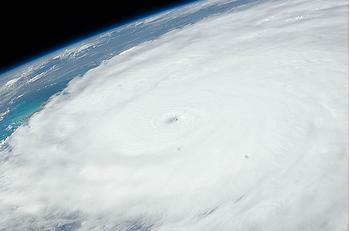 Irene will affect the entire Eastern Seaboard, said Read. All of the Northeast corridor can expect heavy rain, high winds and flooding by Sunday afternoon; except for New England and New York where it will hit Monday morning. FEMA Administrator Craig Fugate told reporters by teleconference today that he has great confidence in Doug Hoell, director of the North Carolina Division of Emergency Management. Fugate said repeatedly that FEMA’s role is to support the governors and urged all East Coast residents to prepare to evacuate when state, tribal or local officials give an evacuation order. Mandatory evacuations began Wednesday morning for visitors to Ocracoke and residents began evacuating Thursday. Evacuations in Currituck and Dare counties are possible. Fugate said FEMA has National Incident Management Assistance Teams deployed in North Carolina and all way up the East Coast including Maine. Teams are on the ground in North Carolina and Virginia and arriving in South Carolina, today ahead of further deployment to potential impact areas. In addition, FEMA is deploying regional teams to: Connecticut, Maryland, Maine, Massachusetts, New Hampshire, New Jersey, New York, Rhode Island and Vermont, to coordinate with state, tribal and local officials to identify needs and shortfalls impacting potential disaster response and recovery efforts. As forward area supply posts, FEMA is using military installations at Ft. Bragg, North Carolina; Westover Massachusetts and McGuire, New Jersey. But Fugate wants to assure residents near those locations that they are not necessarily in the path of the storm. “Because they’re located in those states does not mean we think those states will be impacted,” he said. Fugate said prepositioned supplies include big generators for public safety use, bottled water, shelf-stable meals, baby supplies, blankets, tarps, communications equipment. The Department of Veterans Affairs has begun preparing its facilities along the eastern seaboard in advance of potential landfall. Although all VA facilities remain under normal operations at this time, the Hampton, Virginia VA Medical Center will conduct a partial evacuation, sending some patients needing advanced care to the Richmond and Martinsburg VA Medical Centers. Hurricane Irene blasted across Puerto Rico on Sunday night, dropping up to 10 inches of rain in intermittent bursts, that combined with high winds caused extensive property damage. Fugate tried to reassure recent victims of Midwest flooding the ongoing recovery from the southeastern tornadoes that FEMA is not forgetting about them. “FEMA’s ongoing support of disaster response activities in Puerto Rico and its proactive support for East oast storm preparations, does not diminish its focus from critical federal disaster response and recovery operations that continue, across the nation, he said. Visit www.Ready.gov or www.Listo.gov for tips on creating your family emergency plan and putting together an emergency supply kit.